By Dominick J. Cirigliano Seahorses are one of the newer marine species that have become a part of my fish fascination. I’ve only been keeping seahorses for just over three years but have learned quite a bit about them in that time period. The first seahorse species I kept was the Dwarf Seahorse (Hippocampus zosterae) which were obtained from an online retailer from Florida. Since then I have kept a few different species including the Northern Lined Seahorse (Hippocampus erectus), Southern Lined Seahorse (Hippocampus erectus), Longsnout Seahorse (Hippocampus reidi) and the previously mentioned Dwarf Seahorse. H. reidi. Photo by L. Mann. My goal with marine fish is always to try and provide an environment as close as possible to the specific species’ natural habitat. I measure my level of success by behavioral cues and in the case of seahorses, breeding is used as the ultimate gauge. Northern Lined H. erectus. Photo by L. Mann. Over the last year and a half I have been successfully breeding the Northern Lined Seahorse (H. erectus) that I collect locally here in New York. Through many trials and tribulations I have developed a system for breeding and rearing seahorses. This article is the first part of a two part series focusing on the conditioning of adult seahorses, specifically the Northern H. erectus, and ultimately rearing their fry. The Adult Seahorse System There are many considerations when planning a system to house adult seahorses. I like to mimic the natural environment as closely as possible so research is a must. I’ve been fortunate enough to have spent over 15 years exploring our local waters and have developed a familiarity with the habitat our local seahorses make their home. This knowledge has increased my ability to succeed exponentially. Making sure I had all of the right equipment was the first step in building the system. There are many ways to develop a proper system, but for the purposes of this article, I am going to focus on what has worked or me. My system consists of the following: Tank: I had a 72 gallon bow front available so this was what I decided to use as the home for the adult seahorses. The Male Northern Lined Seahorse can get fairly large and I knew that I wanted to keep a community of them, so I went with a larger tank than most sources would recommend as the minimum for seahorses. In general, the most important consideration for breeding seahorses is the height of the tank; I wouldn’t go any less than 18″ tall. Chiller: In my opinion, this piece of equipment is a must for all seahorses, but particularly for the Northern Lined seahorses. A seahorse’s lifespan can be greatly affected by temperature and although many can handle temperatures in the high 70’s or low 80’s they will not live a full life. For the Northern Lined Seahorse, I wanted to keep the temperature at 68 degrees Fahrenheit. In the beginning I experimented with higher temperatures and even at 70 degrees Fahrenheit I noticed hardship on the adults and less frequent broods. Sump: Personally, I prefer to use “reef ready” systems which include a sump. There are many benefits to having a sump including a place for a refugium to hold live foods and a place to run the equipment. My system uses a 20 gallon long glass tank. I created a customized baffle system in order to have a section to hold a powerful protein skimmer, a live food refugium and the return pump. Protein Skimmer: Since seahorses need to be fed several times per day, and frozen foods such as mysis shrimp can foul any system’s water quickly, a strong protein skimmer is important. My system uses an ASM G3 in-sump skimmer. The skimmer is fed water through a 100% gravity feed that runs from the display tank overflow and includes the recirculation modification for increased efficiency. Ultraviolet Light: Seahorses are prone to protozoan infections so a UV light of the proper proportion is very important. It provides additional protection against any outbreaks. The effectiveness of a UV light greatly depends on wattage and GPH. I use a 25 watt UV light that is fed water from the sump at about 95 GPH. Other Filtration: Since I feed so often, many large particle foods run through my overflow and into the protein skimmer. The skimmer cannot capture all of the foods so some will flow out the return of the skimmer. I use filter socks to capture the remaining particles. Filter socks can easily be cleaned and re-used. Another method of filtration I use is GAC (granular activated carbon) which removes a host of dissolved organics and provides for crystal clear water. Powerheads (water movement): There are many options for water movement in the display tank in addition to the sump return. I like to use Hydor Koralias since they have shown to be engineered to work better with sensitive species such as seahorses and even sea slugs. Seahorses will try and hitch to anything they can wrap themselves around and powerheads with large openings are no exception. My system uses two Koralia Model 2s to assist with water movement. Now that I have discussed the holding system for the adult seahorses, the next consideration is the habitat. I try to keep live rock to a minimum and choose pieces that are extremely porous and/or branching. 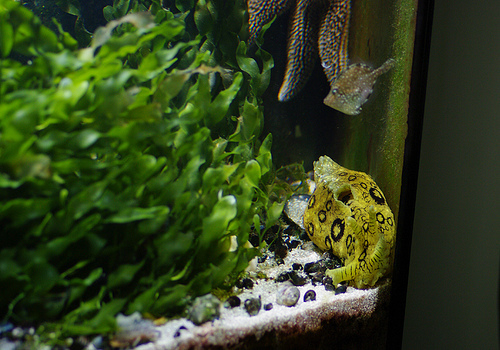 The space in the aquarium is limited and live rock can take up a lot of room without providing much additional value. I only have about 30lbs. of carefully selected pieces of live rock in the aquarium. I use an 8” sand bed to supplement biological filtration. The Northern Lined Seahorse lives amongst eel grass (Zostera marina) which is touchy in captivity, so the additional space I saved keeping live rock to a minimum was used to grow Caulerpa prolifera. 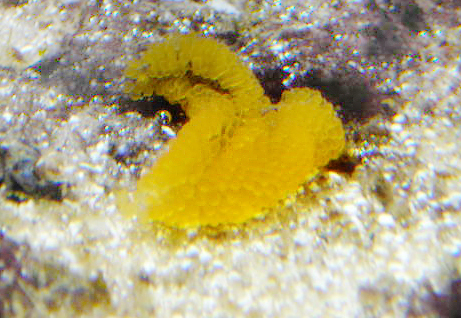 C. prolifera is a macro algae that does quite well in the aquarium. Using a simple 150w MH two bulb lighting system was sufficient to keep the macro algae healthy and growing. Not only does the algae provide a place for the seahorses to hitch, explore and sleep, but it also provides a great habitat for copepods and amphipods to reproduce. While the seahorses will benefit from this live food, copepods and amphipods should never be relied on as the primary food source for your seahorses (see diet and feeding). Another benefit to the algae forest is that the seahorses seem breed much more frequently in this natural sort of habitat. C. prolifera forest being trimmed by a giant sea hare. Photo by L. Mann. 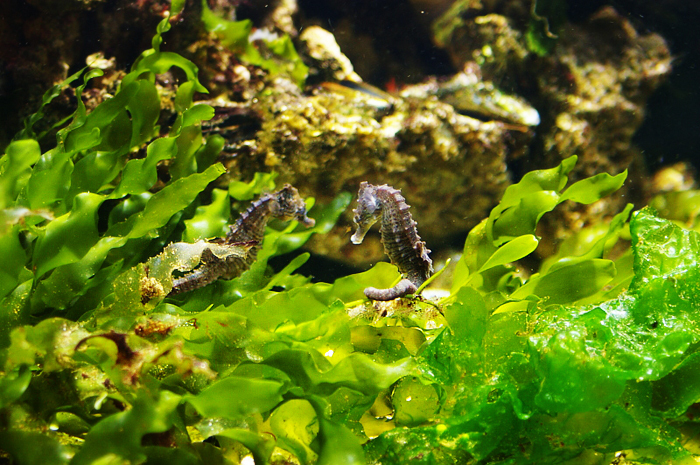 Some of the most commonly asked questions about seahorses are about compatible tank-mates. For the purposes of this article I am going to focus on the least risky and most useful tankmates, which happen to be snails and shrimp. Shrimp make the best roommates for seahorses as they are not only pretty and in most cases harmless, but they also can provide an additional live food source. Cleaner Shrimp (Lysmata amboinensis), Peppermint shrimp (Lysmata wurdemanni) and Grass shrimp (Palaemonetes pugio) are all commonly available and will breed frequently in the home aquarium. 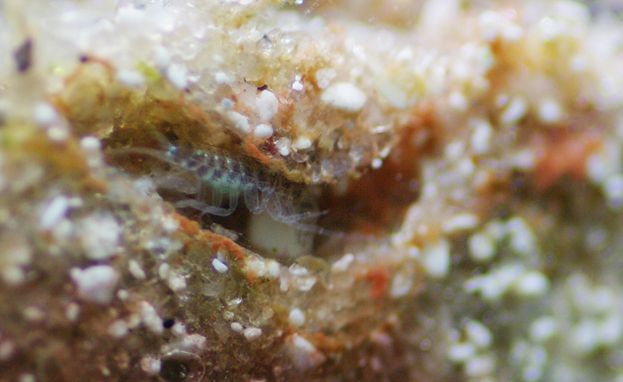 The larvae and fry of these shrimp make for a nice nutritional snack for the seahorses. To pair up the shrimp all you have to do is add two of a particular species since they are hermaphroditic. Snails such as mud snails (Ilyassoma obsolete) and Nassarius snails make great roommates because they will eat any leftover foods and detritus. My tank is mostly full of mud snails since they are abundant locally. Grass shrimp. Photo by D. Cirigliano. Any non-stinging corals make for acceptable tank mates. Seahorses do not learn from being stung and they will continually try to hitch to stinging corals or anemones until they develop infections and die. If you are not sure of the stinging capacity of particular coral species it’s best to avoid them all together. H. reidi hitching on a Gorgonion in one of the author’s previous aquaria. Photo by D. Cirigliano. Specimen Selection and Sexing With any pet, selecting a healthy specimen is very important to long-term success. Healthy seahorses can easily be identified. The first things to look for are any physical issues. Fungus infections (white film), bacterial sores and gas bubble disease (bloated pouches of males) are the common problems. Sometimes it can be difficult to determine whether a bloated male is carrying eggs or has gas bubble disease; watching the behavior of the sea horses will provide the appropriate clues to its health. Healthy seahorses will spend their time searching for food near the base of algae and rocks. Seahorses seen scaling the glass frantically or swimming erratically should be avoided. These are signs of stress and potentially other problems. ThoughI have the knowledge and ability to catch my own, for most hobbyists, it is best to buy captive bred and born (CBB) seahorses. Unlike several years ago, they are now abundantly available and are much hardier than wild caught specimens. 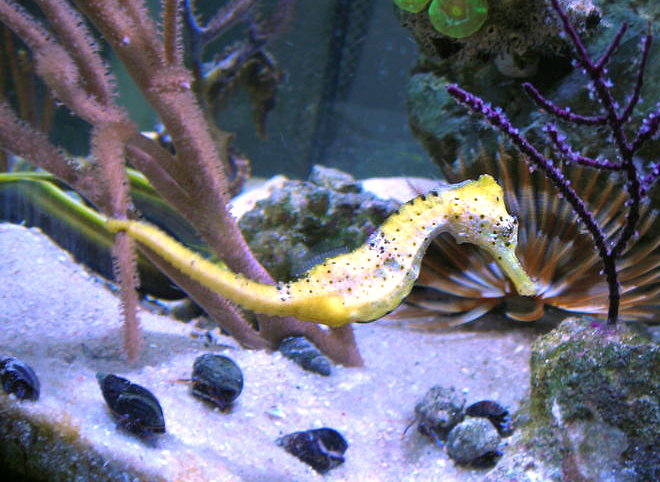 CBB seahorses are already eating frozen foods in most cases which is a tremendous advantage for keeping them healthy and happy in an aquarium environment. 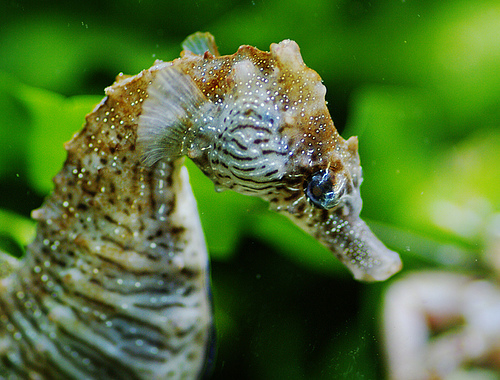 When considering purchasing seahorses, it is always best to ask to see them eat frozen foods. Nothing can be more daunting, expensive and life threatening (for the seahorse) than obtaining seahorses that are not eating prepared foods. I’ve read resources that claim seahorses can be kept alive on a system’s pod population, but I do not believe this to be true. Regardless of my belief, seahorses will do much better if they are eating prepared foods. Sexing seahorses is very easy. 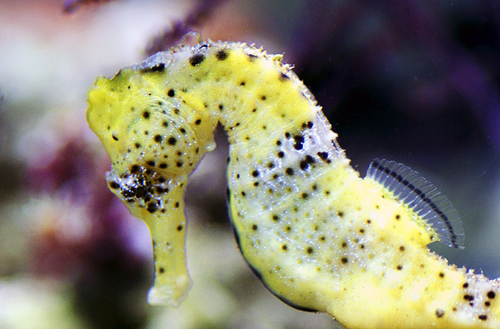 Since the male seahorse carries the eggs and fry (often referred to as ponies) they have a pouch which is absent in females. The pouch is located on the abdomen of males and extends down to the beginning of the tail. Diet and Feeding There are many different foods available for seahorses. Since my seahorses were locally collected, I had the additional daunting task of getting them eating prepared foods. Before I collected the seahorses I had to make sure I had a few weeks worth of live foods on hand. Amphipods and Live Mysis Shrimp are available though many outlets. Some hobbyists use enriched adult brine shrimp, but I prefer to avoid them because of their low nutritional value and the hardship of keeping them fortified with vitamins. 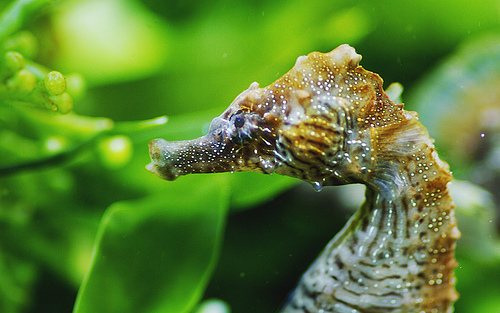 Seahorses should be fed 3 times a day in a new system or a system lacking live foods for supplementation. 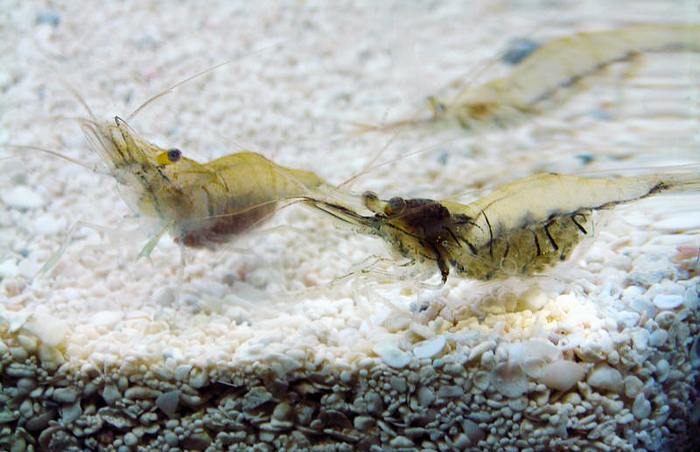 The food of choice for CBB and other seahorses taking prepared foods is frozen mysis shrimp fortified with nutrients using a product like Selcon. In an established system with an abundance of “pods”, feeding two times a day is sufficient as the seahorses will supplement their diet with live foods that will benefit them as well. Providing variety is important so at least once a month I add live foods such as amphipods, mysis shrimp and even the occasional adult brine for stimulation purposes. People have asked me if my seahorses stop eating prepared foods when they are offered live and this has never been my experience. Well adjusted aquarium seahorses will continue to eat prepared foods even if offered live foods on occasion. Amphipod. Photo by L. Mann. Mating and Breeding Beyond offering the proper habitat, diet, and having members of both sexes, there is not much else that can be done to promote mating. It is up to the seahorses to do their part. I’ve seen references made to the lighting schedule playing a role and it seems logical, but that has not been my experience. The main components for promoting frequent breeding is the quantity of food and quality of the environment. I have noticed that water temperature in the extreme for the Northern lined seahorse will affect breeding, but this is when temperature is lower than 65 degrees Fahrenheit and higher than 78 degrees. H. erectus in the C. prolifera forest. Photo by D. Cirigliano. Since I decided to have a group of seahorses I went with 4 males and 6 females. This seemed to give the males more chances to carry eggs. However, I never had two males carrying eggs at the same time. I suspect that a hierarchy was established and only the larger male attracted the females. On occasion I witnessed two males courting the same female but never any aggression between seahorses. During the courting “dance”, the male swells his pouch by allowing water to enter. The male’s coloration brightens and he shows off his large pouch to the female by constantly putting it in front of her. When the female is satisfied she will swim to the front of the male and align her abdomen with the pouch and then they will swim together up towards the surface –hence the previous mentioned importance of tank height. The female will continually fill the pouch until the peak of their dance is reached. On occasion the female does “mis-fire” and eggs will be found on the sand bed. I was quite confused the first time I noticed this and didn’t realize I was looking at seahorse eggs. When the female successfully deposits eggs in the male pouch it will no longer appear to be sunken in. As time goes by, it becomes more obvious that the male is carrying eggs as the size of the pouch increases noticeably. Within the next several days the pouch will “swell” until the fry are released by the male. Misfired seahorse eggs. Photo by D. Cirigliano. If you are serious about breeding seahorses you should log the breeding behaviors so you can better prepare yourself for gathering the fry. Logging when the male usually releases the fry can also be used as an indicator of a problem. Males are known to prematurely release the fry in the presence of a stress factor which you’ll have to identify. Fry that have been kept by the male for the proper period of time have the strongest chance of reaching adulthood. Now that I have discussed the proper system and the care of adult seahorses, we are ready for the next step of the breeding process which is the collection and rearing of the fry. In part II of this series we will review the raising of the fry from collection to adult hood. Included will be the design I created for holding the fry with detailed steps for building your own system. H. erectus. Photo by L. Mann. If you have any questions, please don’t hesitate to contact me at domboski@hotmail.com.